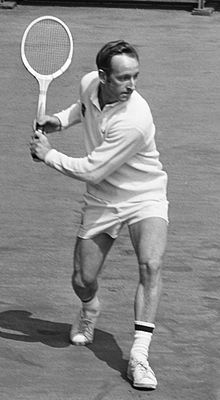 Rodney George "Rod" Laver MBE (born 9 August 1938, in Rockhampton, Australia) is a former tennis player from Australia and a former world #1 in ATP tennis rankings. ↑ "Rod Laver". atpworldtour.com. Association of Tennis Professionals (ATP). Retrieved 27 January 2016. ↑ Garcia, Gabriel. "Rod Laver: Career match record-pre open era and open era". thetennisbase.com. Madrid, Spain: Tennismem SL. Retrieved 17 November 2017. This page was last changed on 17 April 2019, at 16:25.